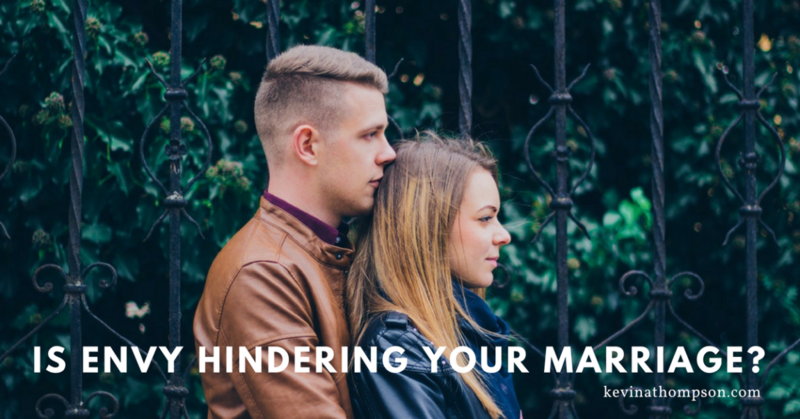 Is Envy Hindering Your Marriage? A good marriage is built on a very basic principle–I’m for you. More than anyone else in the world, I am your greatest cheerleader, supporter, and friend. I see you better than anyone else, yet I love you more than anyone else. I want the best for you to such an extent that I’m willing to submit my own dreams and desires in order for you to succeed. But few things kill trust like envy. When envy is present, instead of being for my spouse, I’m jealous of what they have, who they are, or what they are experiencing. Rather than cheering them on, I’m holding them back. You can’t love the one you envy. Is Envy Present in Your Marriage? When we experience discontent because of what someone else has or who they are, we are experiencing envy. It’s an emotion born from the perception of lack. It can only exist as we compare ourselves to someone else. As comparison occurs, we feel bitter about our circumstance believing we deserve what another has or deceiving ourselves into thinking another has a superior life because of who they are. Our Spouse. Envy can be present with our spouse. We can believe they have an easier life, are given too much praise/credit, or desire aspects of their lives. Rather than being happy for them, we desire to have what they have. This desire causes us to hold our spouse back rather than to propel them forward. Instead of being for our spouse, we are (often times unknowingly to them) against them. Other People’s Spouses. Envy is often sourced in our jealousy of another person’s spouse. Seeing just an aspect of who they are, we compare our limited understanding to a fuller picture of who our spouse is. We then write the story that the other person is better than our spouse. We believe that our marriage would be better if our spouse was like the other person. Other People’s Marriages. While it’s healthy to allow the positive traits of others to inspire us to do better, envy doesn’t cause us to love our spouses more. It leads to us being more critical and discouraged regarding our relationship. 1. If your spouse was given a bucket list trip that didn’t include you, would you be truly excited for them or would you feel more disappointed that you don’t get to go? 2. Is there a person which you believe would make a better spouse than the person you married? 3. Is there a marriage of a friend or couple which discourages you because of how good they seem to have it? If you answered yes, to any of these questions, envy is hindering your marriage. Tell yourself the rest of the story. What we see from others is just a part of their story. The perfect stories on Facebook and the pretty pictures on Instagram might be true, but they aren’t complete. Everybody has problems. (Trust me…EVERYBODY) Too often we fall for the deception that we are messed up but everyone else is perfect. When we believe this lie, we are tempted to be envious of what others have. Be for your spouse. It sounds like such obvious truth, but sadly many people are not truly for their spouse. Rather than wishing for their spouse’s well-being, they are hoping their husband or wife will suffer or struggle. This isn’t loving. It’s rooted in selfishness. Unable to look beyond themselves, they interpret everything in regards to how it compares to themselves. Whenever someone is completely focused on self, they will rarely be for other people. Envy is a sign we are selfish. Rehearse positive thoughts. Any of us can have a passing envious thought at any moment, but envy only takes root in our hearts as we give those thoughts the resources necessary to grow. As we continually compare and rehearse negative thoughts, jealousy grows. But when we push aside one envious thought and reflect on the positive aspects of our spouse and our marriage, envy does not take root. Envy hinders many relationships. Thankfully, it is a choice. While it’s sad how many couples choose to allow it to ruin their lives, we can make different choices. Rather than allowing envy to control us, we can take charge of our thoughts and lives. Love your spouse, don’t envy them.